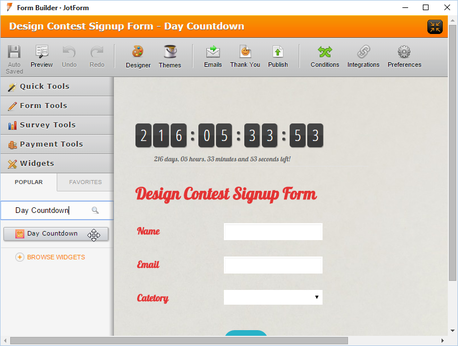 The Day Countdown delivers an essential sense of suspense and anticipation on your form. 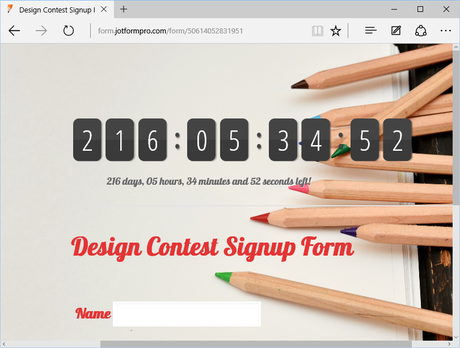 You can now inform your form users how much pending time there is towards a particular goal like a contest deadline, a website or feature launch among other events. 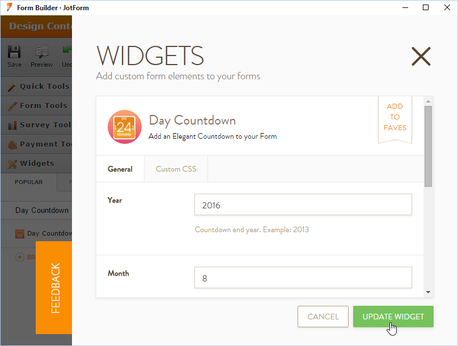 This widget will add a countdown timer on your form. Its easy to configure the widget - all you have to do is define when the clock stops - from the year up to the last minute. Nice one. For small width forms, it has some issues.So I could not use it in my forms. Great Timer! Would be nice if we could add to the text below the counter. Counter looks great but would not function in my form. Excellent, but language cannot be changed !! Added a nice touch to my form. Could use a little more customization.